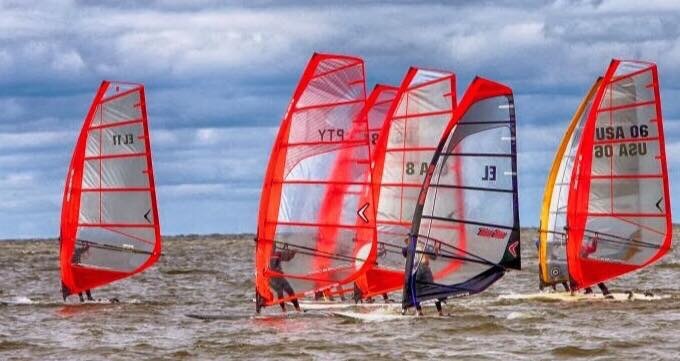 6 slalom races Saturday morning with racers on 9.5-7.5 sails. Saturday afternoon was a distance race with lighter winds. Sunday morning there were 4 course races in planing winds. It was a great start to the race season. Up next is the Dam Jam in Iowa May 20-21. 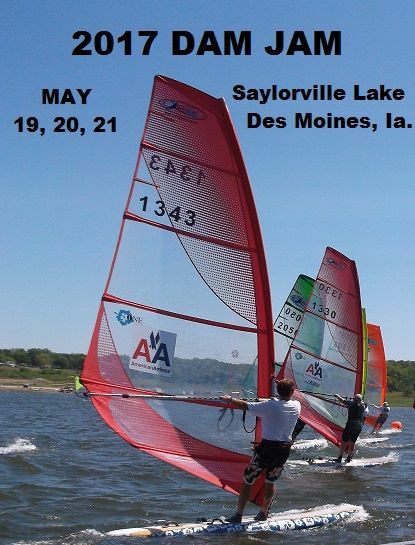 The 2017 Dam Jam is coming up May 19-21 in Saylorville, IA (near Des Moines). Registration & Entry Fees for Competitors: Competitors must check-in on site at the registration desk located at the Race site. The registration will be open for all racers from noon until 7:00 pm on Friday May 19 th and from 8:00 am until 9:30 on Saturday, May 20th. Pre-registration is appreciated for planning purposes. Please contact Barry Tofteland or Larry Reed via email or phone number provided below, and leave a message indicating who will participate. Do not send money, it will be collected at check-in when registration is filled out. The fee for this regatta is $30 per competitor. Saturday Lunch will be Provided, All other meals will be on Your own. No shirt’s again this Year! Registrations that are received prior to May15 will have the registration fee discounted to $25. Send email or call to pre-register (contact information below). In order to encourage new participants in the sport, we are charging only $ 00 for the Workshop fleet (FREE). Happy Spring everyone! Remember that the race season starts in two weeks with the Walleye Regatta in Fond du Lac May 6-7. Racing will take place right off of the Windpower Windsurfing shop. Facebook Mowind or email arden.EL11@gmail.com with questions. Saturday: Registration ~ 8:30-10 am. $20 registration, first time racers and youths <18 free. First Race possible race 10:30 am. Last possible race 5 pm. Sunday: First race ~10am. Last possible race 2 pm. 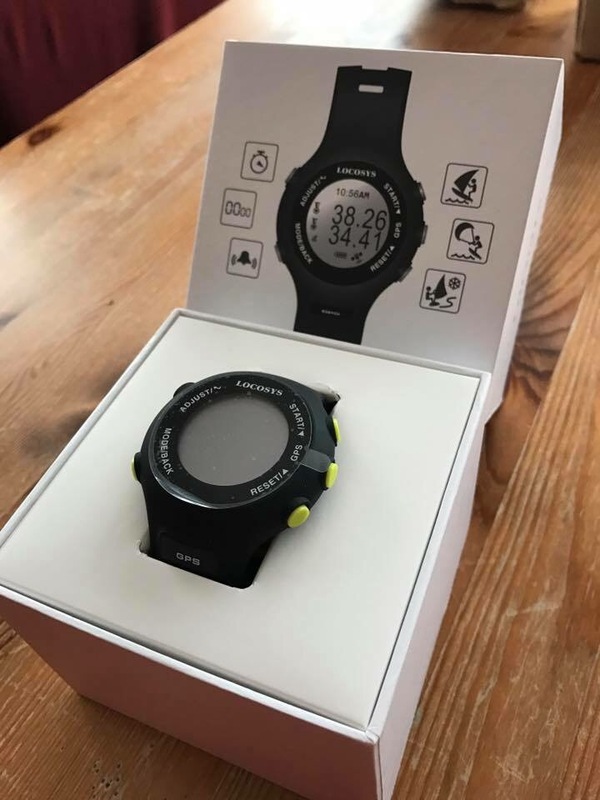 We will also begin our 2017 fund raiser by selling raffle tickets for a Locosys GW-60 GPS watch that was graciously donated by Craig Bergh of the Midwest Speed Quest. Tickets will be available at all Mowind events and the winner will be selected at the year end banquet during Windpower Championships September 23-24. There was lots of racing at the Windpower Championships this weekend. 10 races by ~12:30 on Sunday, and almost squeezed in a long distance race after that. But, some storms were closing in on the radar so we decided to wrap things up. Mark Boersma from Michigan distanced himself from the fleet early and was able to win the Championship by a good margin. Andy Gratton sailed stronger as the event went on to take second place. Arden Anderson, Niels Zaunmueller, and Adam Anderson rounded out the top five. In Sport Fleet, Del Carpenter took the title sailing a great series on his Kona gear, followed by Victor Hora and Ron Mitton. Thank you to everyone at Windpower Windsurfing for putting on the event. It was a great start to the 2017 MOWIND Race Series. The final scores for the 2016 Race Series are complete, and we had an awards banquet last night at the Windpower Championships. Congratulations to all!